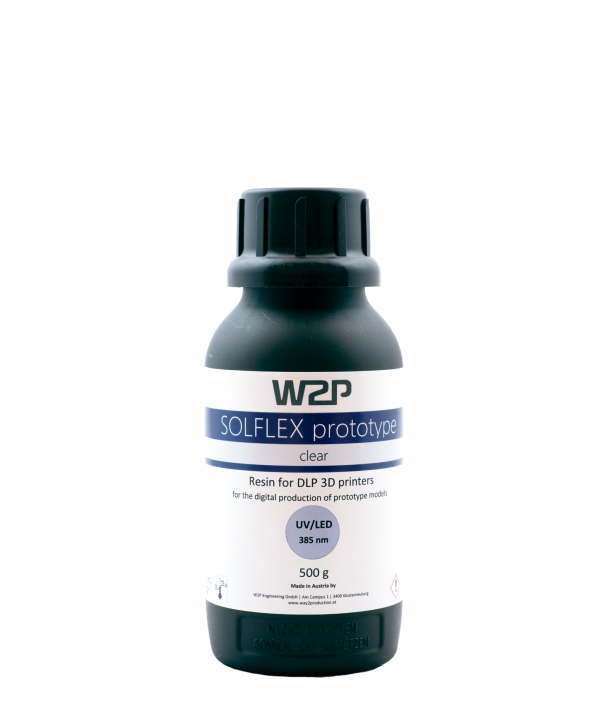 SolFlex 3D printers are open systems and grant flexibility in terms of resins. 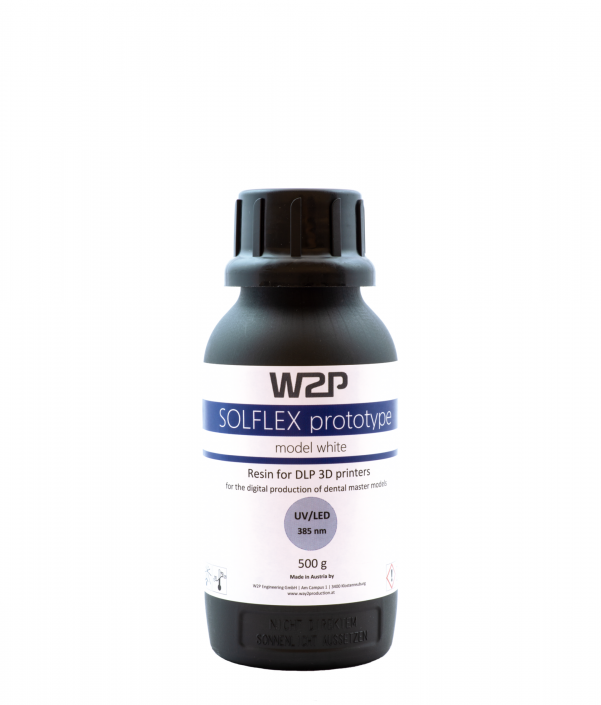 Besides the SolFlex resins, also 3D printing materials of other manufacturers can be processed with SolFlex 3D printers. Light-curing 3D resin for the generative fabrication of cast objects using precision casting technology. Burns without residue in the mold, even with large volumes. Embedding is performed with phosphate-bonded standard embedding compound. Precise reproduction of the finest surface structures. 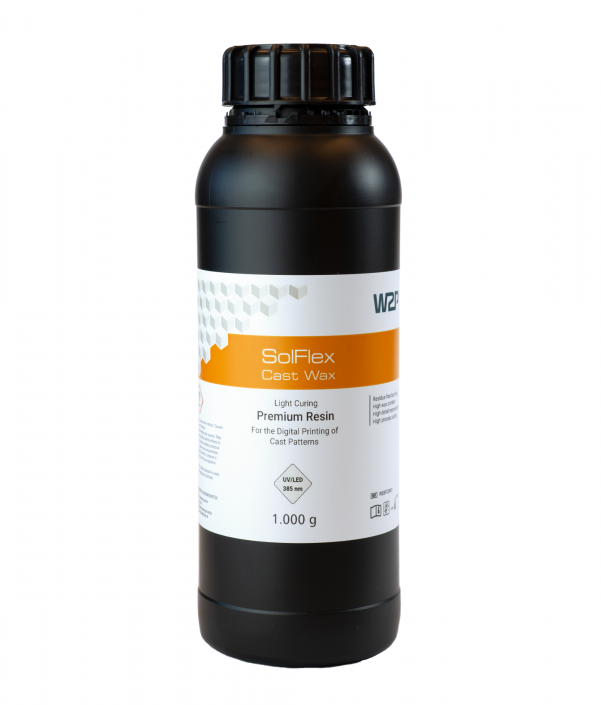 Low-viscosity approach for low material consumption and more rapid cleaning. High process reliability and precision in construction. Light-curing, temperature-resistant 3D resin for the generative fabrication of cast objects using precision casting technology. It can be used for dental technology applications (3D printing of cast or pressable patterns), hearing aid applications (3D printing of cast forms for silicone earmolds) as well as for jewelry (3D printing of cast patterns). Burn without residue. Light-curing 3D resin for the generative fabrication of prototypes and functional parts. 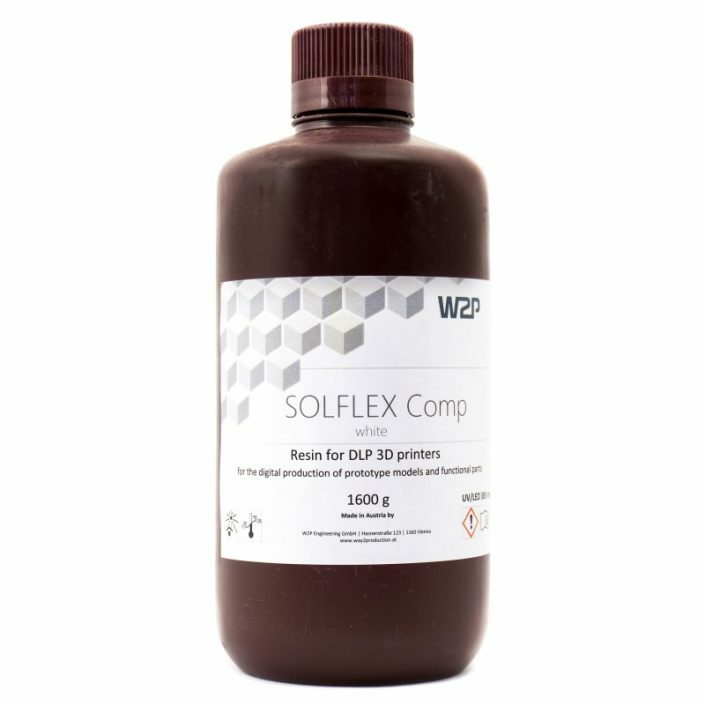 SolFlex Comp White is a quartz-filled material which enables high compressive strength and temperature resistance. Also, the mineral filler material leads to an exceptionally low thermal expansion and can be used to produce high performance functional parts such as injection molding tools, prototypes and also functional end-use parts. Light-curing, biocompatible 3D resin for the generative fabrication of drilling templates for implantology, X-ray templates and occlusal splints. 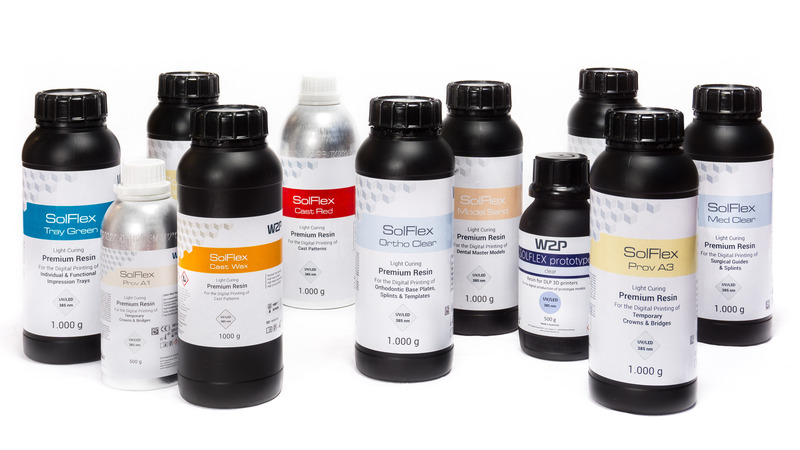 Clear-transparent formulation for visual control in the working area. Process reliability through high initial hardness and final strength. Low-viscosity approach for low material consumption and more rapid cleaning. Highest mechanical bending and breaking strength, without being brittle. BPA-free, neutral odor and taste. Light-curing 3D resin for the generative production of dental models (also for the thermoforming technique). All-round dental model material enables to print parts with excellent precision and best surface quality. Light-curing, temperature-resistant 3D resin for the generative fabrication of dental models for the thermoforming technique. Precise reproduction of details, maximum surface hardness and edge stability of the models. Precision in construction, tactility and stability meet the high demands of model fabrication. The pronounced intrinsic stability also allows the fabrication of hollow master models. 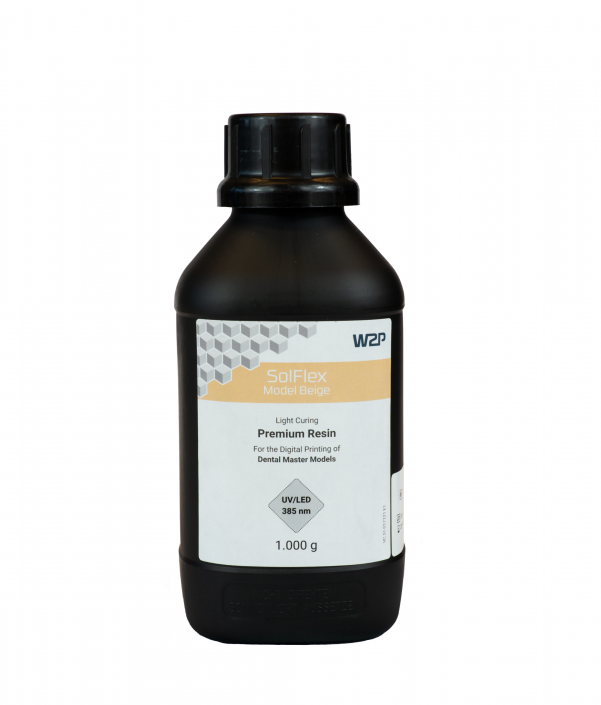 Low viscosity for considerably easier cleaning and lower material consumption. Light-curing 3D resin for the generative fabrication of dental models. Precise reproduction of details, maximum surface hardness and shape stability. Maximum precision in construction, feel and stability meet the high demands of model production. Opaque color adjustment for the optical detection of surface structure, preparation margins, etc. Light-curing, biocompatible 3D resin for the generative fabrication of base parts for orthodontic apparatuses, drilling and X-ray templates, occlusal and fixation splints. Benefits: maximum reliability of construction process, mechanical strength, easy to polish. Breaking strength, elasticity and influence of moisture following the orthodontic standard. Adaptation of the occlusion field, easy fixation of orthodontic wire elements and auxiliary components. Resistant to oral conditions, neutral odor and taste. Light-curing 3D resin for the generative fabrication of prototypes. Light-curing, biocompatible 3D resin for the generative fabrication of temporary crowns & bridges. 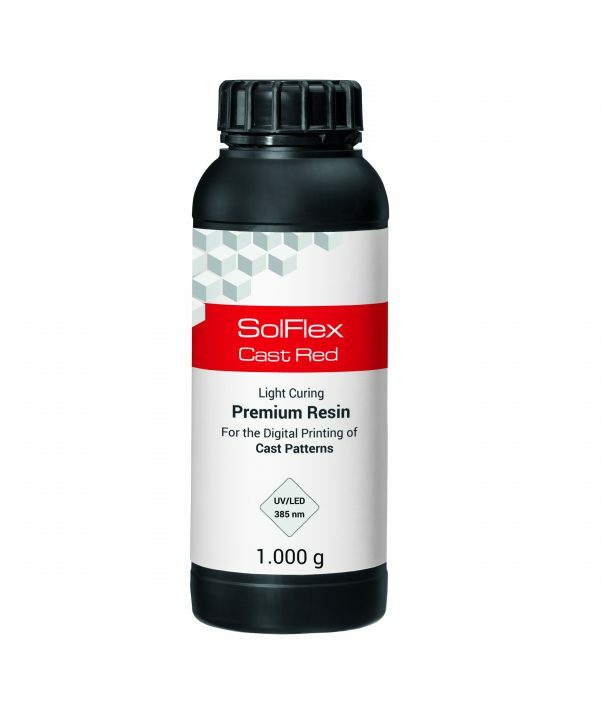 Exceptional breaking and flexural resistance, high abrasion resistance. Natural tooth esthetics, brilliant, translucent colors. Easy surface processing and polishing. 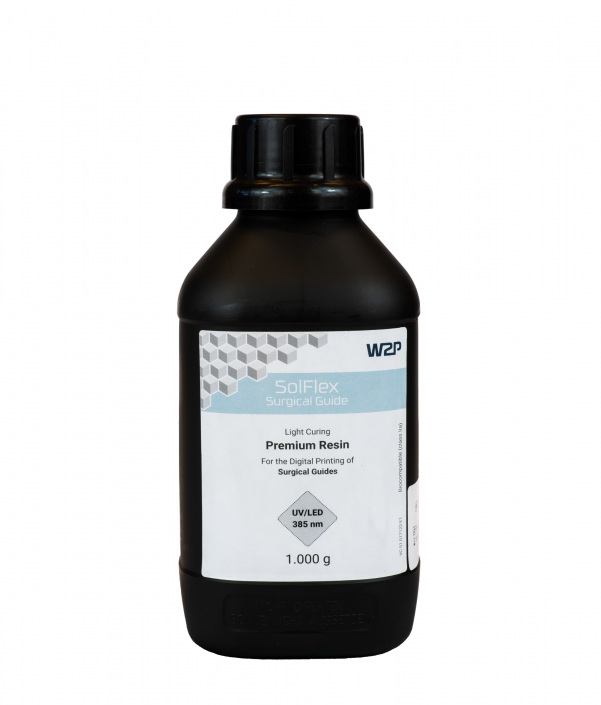 Low viscosity for low material consumption and more rapid cleaning. Resistant to oral conditions, no odor or taste irritations. Light-curing, biocompatible 3D resin for the generative fabrication of surgical guide for implant surgery use. The high precision of printed objects enables best precision during surgery. The material can be sterilized at 134°C. Light-curing 3D resin for the generative fabrication of prototypes and functional parts. 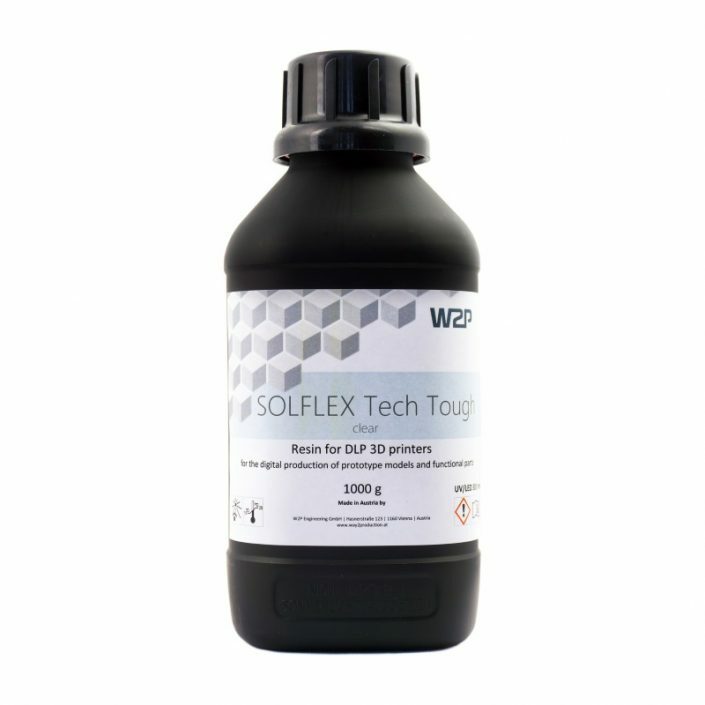 High impact strength, high E-modulus, and good heat deflection temperature are the key features of SolFlex Tech Tough. These properties ensure an adequate quality of tough and complex 3D printed parts. High accuracy and mechanical strength. Light-curing, biocompatible 3D resin for the generative fabrication of individual impression and functional trays and base resin plates. 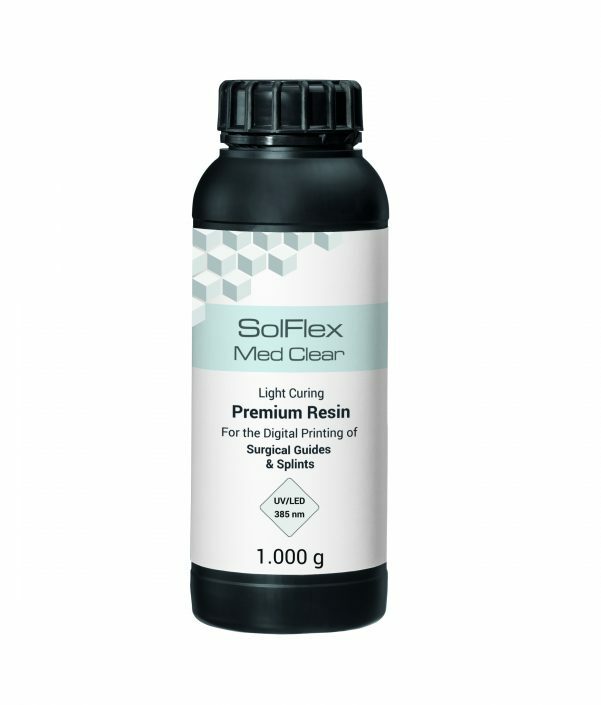 Low viscosity for low material consumption and more rapid cleaning. Maximum construction speed, very high dimensional stability and torsional rigidity. No mechanical reprocessing of the surface necessary. Suitable for all impression materials, neutral odor and taste, MMA-free.